Love me some Mercedes SLS Electric Drive. 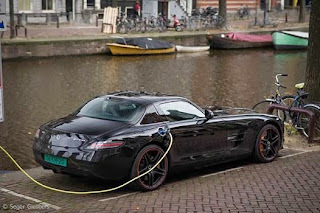 Not this specific car, but when the SLS Electric Drive first came out, it came with a special yellow color which was awesome, but now more images are getting found of other standard colors. I loved the yellow version, but this black with the red accented wheels is just so beautiful.